️PERFECT GIFT: Perfect gift choice for golf lovers.Set up a game Galileo Thought Golf Hitting Net----The Best Choice for Golfer! Why choose Galileo Thought golf hitting net? ⛳️ IMPROVE YOUR AIM: Designed with three targets in different height to better improve your short distance chipping accuracy. 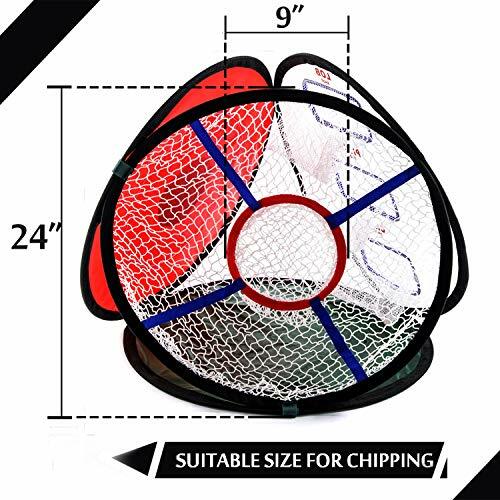 This is a must-have chipping net for all level golfers to master short game, you can also play golf like a pro. ⛳️ EASY TO ASSEMBLE: Instant pop-up design makes you easily set it up in seconds with no tools. Make your golf training more convenient AND easy set-up / take-down. ⛳️ ETERNALLY ATTACHED POLES: With our patent eternally attached poles,you can never wory about losing parts. ⛳️ PORTABLE PACKAGE: Packed in a carry bag, Galileo golf chipping net is truly lightweight, foldable and portable. ⛳️ PERFECT GIFT: Perfect gift choice for golf lovers.Set up a game with different target pockets whenever and wherever you want, beat the limitation with your families, friends or colleagues, making your practice more interesting than just hitting shots.